Lindsay Lohan Jokes About Mom Dina Dating a Man She's Never Met: 'No More Weird Catfish Please' - Integration Through Media ....! Lindsay Lohan is weighing in on her mom Dina Lohan‘s (literal) mystery man. During Thursday’s episode of Celebrity Big Brother, Dina, 56, revealed that although she’s been talking to “a special someone” for five years, they’ve never actually met in real life — or even FaceTimed. Though Dina seemed confident that her relationship is the real deal, her fellow houseguests Kandi Burruss, Tamar Braxton and Natalie Eva Marie thought the star was likely being catfished. After the romance was discussed on TV, Lindsay, 32, extended her support for her mother. 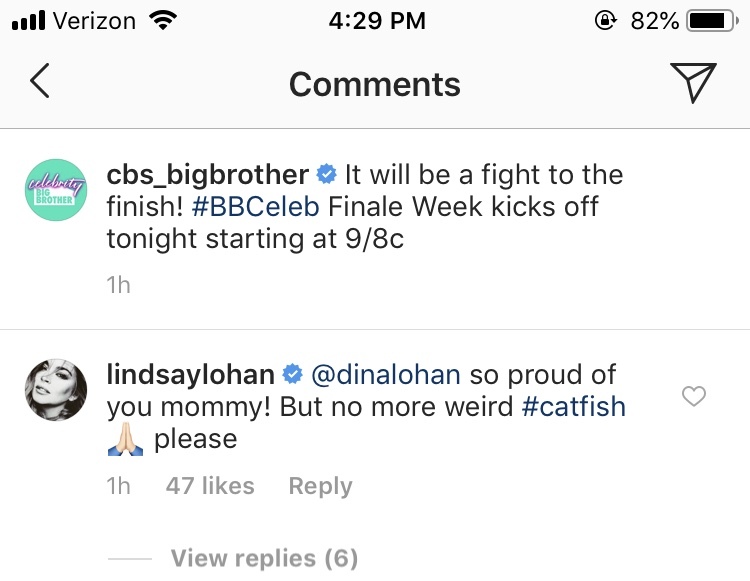 “@dinalohan so proud of you mommy!” Lindsay responded on Big Brother‘s official Instagram comment, which referenced the “fight to the finish” on finale week. On Thursday’s episode, the New York-based star went on to explain that she hadn’t met her long-term boyfriend yet because he was currently living in San Francisco taking care of his mother and he doesn’t use FaceTime. Another celebrity that has had a vested interest in this potential catfish situation at hand was the host of MTV series Catfish, Nev Schulman. “YOU GOTTA BE KIDDING ME,” Schulman, 34, wrote on Twitter the following day alongside a news story about Dina’s mystery man, in an interaction captured by Comments by Celebs. “Let’s do this!” he added, seemingly indicating he’d love for Dina to be on the MTV reality show, which tracks down online daters to bring them face-to-face with their partners while exposing their fake personas. Dina’s new relationship comes over a decade after the reality star settled her divorce with ex-husband Michael Lohan, 58. Michael and Dina got married in 1985 and agreed to a separation in 2005. They are parents to daughters Lindsay and Ali, 25, and sons Cody, 22, and Michael Jr., 31. Celebrity Big Brother will air on Monday at 9 p.m. ET, and the two-hour season finale will air on Wednesday at 9 p.m. ET, both on CBS.